This post contains affiliate links, but I only link to things that I use! If you’ve read my blog for long, you’ll know that I absolutely love the game show Minute to Win It. One of the things I love most about it is that you can incorporate the overall game idea (quick games using household items) into pretty much any theme you want like I did with my Lego Minute to Win It Games. 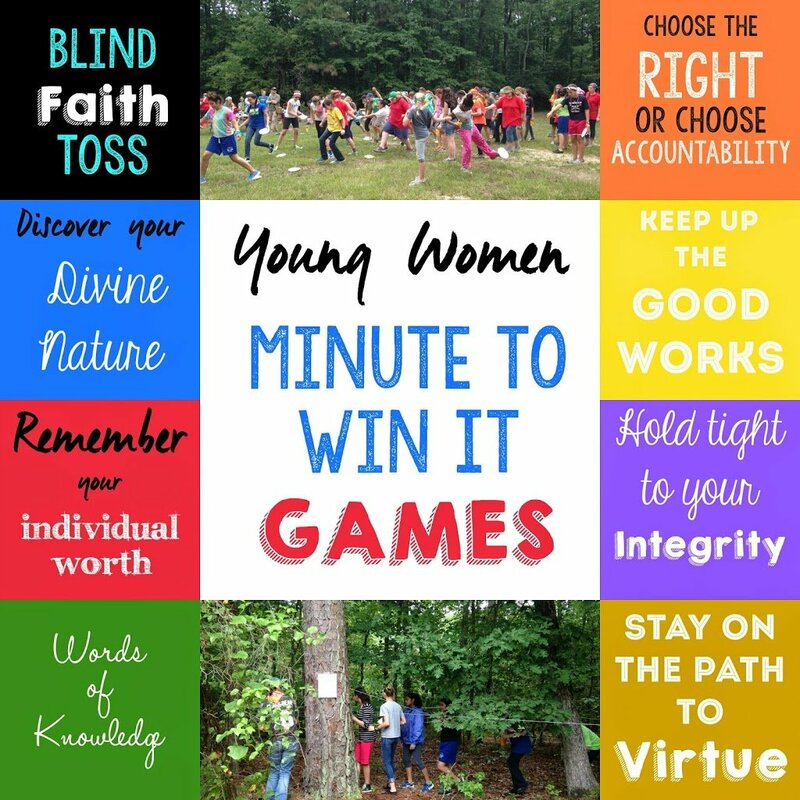 I was in charge of putting together some games for girls camp and thought it would be fun to play young women’s Minute to Win It, using games I put together using the eight young women values. These could also just be fun and silly party games as well. Either way, it’s a pretty fun young women’s activity idea! The way we set these games up was to split up our group of 75 young women into teams of 7-8 girls. Each of those teams competed at the same time to see who would come in first, second, etc. in each of the games. We kept track of the winners of each game and gave our prizes for each individual game at the end of the night. If you only had say 10 girls and wanted to play these things individually, you can easily adapt most of them to work for an individual rather than team. Play: Blindfold one team member and give them the bucket. Have the rest of the team line up across from the blindfolded team member and gave the first person in line the bag of mini marshmallows. When the time starts, have the first person in the line toss mini marshmallows to the blindfolded team member until the blindfolded member catches a marshmallow in their bucket. 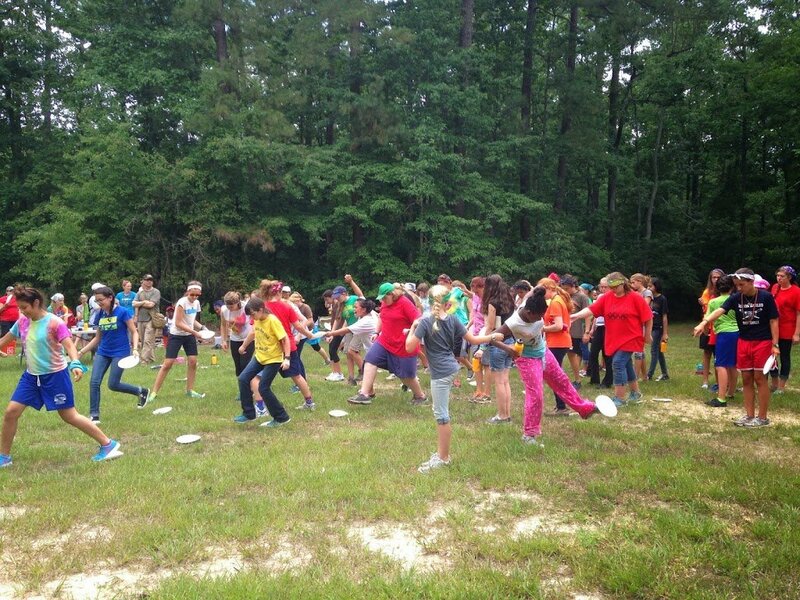 Once they catch a marshmallow, have the team member who threw the marshmallow switch places with the person who caught it (don’t forget to switch the blindfold!). Continue until the team has caught three total marshmallows. Definition of divine nature from the personal progress manual – I have inherited divine qualities, which I will strive to develop. One balloon per word in the definition (11). I recommend doing different colored balloons for each team, but you can just make sure they keep them separate as well. Prep: Cut out each individual word of the definition and stuff each individual word into a different balloon. Play: Give each team a set of balloons (that are stuffed with the definitions). Tell them when you say go that they must blow up the balloons, pop them, find the words inside, and unscramble the sentence. The first team to unscramble the definition wins. Play: Have each team sit in a circle with the leader at the head of the circle. When you say go, the leader should whisper the phrase to the first person in the circle. That person will then whisper the phrase to the next person in the circle and so on, just like in an old-school game of telephone. The first team that can pass the entire phrase around the circle from the leader at the beginning all the way to the leader at the end wins. Figure out 10 scriptures that all have the same unique word in them (so not a, the, and, etc.). If you’d like my list of scriptures, email me. Once you’ve determined your scriptures, print or write out the scripture reference for each of those scriptures, one copy for each of the teams. Play: Give teams the list of scriptures. Have them look them up as quickly as possible and determine what the shared word is among all of the scriptures. The first team to come up with the shared word wins. Prep: Take about 1/10 of the slips of paper and right the words “The Right Choice” on them. Or if you want to make it easier, just print out a sheet of paper with those words copied on it. On the rest of the slips of paper, write silly things for the girls to do that will take 15-30 seconds such as singing I’m a little teapot, doing 10 jumping jacks, hopping in place for 15 seconds, etc. Once you’ve finished writing out the silly tasks, put them with “The Right Choice” papers and mix them up. Line all of the plastic cups up on the flat surface area and underneath each of the cups, put one of the slips of paper. Play: Teams should line up in a straight line about 100 yards from the table of prepared cups. When you say go, the first person on the team should run to the table and choose a cup. If the slip of paper in their cup says, “The Right Choice,” they are done. If it has an “accountability task,” like singing I’m a little teapot, they have to do the task before running back to their team to tag their next teammate. The next teammate then runs to the cups, chooses a cup, and performs the task. Repeat until each of the teams has picked the right choice. Prize: Pack of gum for “chews-ing” the right. A set of yellow balloons for each team, the number of balloons depends on the numbers of people you’ll have playing. You’ll want at least the # of team members + 2 balloons. Prep: Blow up the balloons. Once blown up, write “Good Works,” on them. Play: Tell each team to get in a circle. Once they are in a circle, have each team member put out their hands and grab the hands of two different teammates, other than the person directly across from them and the person directly next to them. Once all teams have grabbed hands, say go. Teams must work together to untangle themselves. The first team to untangle into a circle wins. Supplies Needed: Enough paper plates for each person playing + 1 additional plate per team (i.e., if a team has 8 players, you’ll want 9 plates for the team). Prep: Setup a start and finish line, approximately 100 yards away from each other. Have teams line up in a straight line with the first person in the line right behind the starting line. Play: Teams must get their entire team from the starting line (every player must cross it) to the finish line and then back again to the starting line (everyone must cross it on the way back as well). The catch is that after they pass the starting line at the beginning of the game, they must ALWAYS be on a paper plate. They can get as creative as they want in terms of doing piggy back rides, etc. (don’t tell them this), but no one can ever touch the ground. The fastest team to get their team from start to finish and back to start wins. Prize: Gold candies such as Rolos, Reeses, etc. Thanks! We have a joint YW activity coming up soon and we are in charge, so I will be passing these on! You are the best! Thanks for sharing such an awesome activity! Would you also share your Divine Nature definition and your list of 10 scriptures? Thanks Priscila, our girls had a great time with these activities! I just added the divine nature definition and scriptures I used to this post. If you have more girls, I would just find some additional scriptures with the same word. How fun Sariah! Yes, you can have them too. Just click in the link to download the document with all of the details. If you can’t download it, send me an email at britni@playpartypin.com and I’ll email them to you. And where from the Philippines are you from? My sister actually just got back from her mission in the Ilo Ilo mission, so I’m quite fond of the Philippines! I really like this activity. I am having a hard time understanding “Stay on the Path to Virtue” game. could you give me a little bit more of explanation on it? Geovana, the basic idea is that the girls have to cross from one designated line to another, standing on paper plates as they do so. Divide your girls into two (or more teams) and have them line up behind the starting line. Give the girls a stack of paper plates, the number should be equal to the number of people on the team. So if the team has give players, give them five paper plates. All of the girls have to go from the starting line to the finish line (and back if you want) by stepping on the paper plates (kind of like hopping on stones to cross a river). The tricky part is that because there is only technically one paper plate per girl, the girls have to strategize on how they’re going to move forward because if everyone is standing on a paper plate, there’s not a paper plate to move to next. In the past I’ve seen girls carry each other, have two people stand on a paper plate, jump really far, etc. Does that help? Great ideas! Do you complete these in 1 minutes (like the traditional game) or do they take a few more minutes? Thanks. They take a few more minutes @Emily, although some of them (like the marshmallow toss) might not take the girls very long. Love this idea. Since I don’t have printing capability, can this game book be ordered? Thank you. Unfortunately I am unable to send you a game book. Maybe try sending it to a local print shop like FedEx or Office Depot! We did this last night in the Cultural Hall to begin our new year. It was a HUGE success!! We had so much fun and after each section we talked briefly about what that value meant and how it affects our lives… Thank you for sharing!! We LOVED it!!! This is an awesome idea, thanks for sharing! This activity will really help our Young Women in Pago Central learn more about their values and standards. Thanks for sharing and love the activities. Thank you so much! I help out with my kids church camp. These games are so simple, yet involved. You have just made at least an hour of my life so much easier. Thanks so much for these games focused on the young women values,I have been called recently as a young women President in my ward in Lagos Nigeria and I have been thinking of an activity that is colored coded and centered around the young women values that will be fun..
You are very welcome! E-mail me anytime with questions…i’ll see if I can help! Have fun with your girls!